After over thirty-five years, one would expect that the impact of the “British Invasion” of the mid-sixties, would have lessened within the Pop music realm. With the advent of World Beat, Grunge, Electronica and Rap, one would think that we had finally relegated the sunny world of the likes of the Beatles, the Stones, the Who and the Kinks to the realm of history. Yet the influence of the aforementioned bands, as well as countless others of that time, in today’s Pop music are like colorful threads in a tightly woven fabric. One cannot deny the World Beat roots in the Beatles’ “Within You Without You” or “Inner Light,” the pure Grunge of their “Helter Skelter,” or the Electronica of their “Tomorrow Never Knows” or “Revolution #9” (where John Lennon utilized tape loops— the analog predecessor to a technique which can now be accessed today on nearly any piece of music software or electronic keyboard). The Beatles introduced the idea of a “concept album” with Sgt. Pepper’s Lonely Hearts Club Band (although their concept was loose, to say the least). The Who and the Kinks, perhaps came closer to the spirit of the true “concept album.” Pink Floyd may have perfected the genre, with several albums, culminating in The Wall. So, at this late date, it seems nearly anachronistic for a band to conceive of a concept album, much less one in the style of the masters. 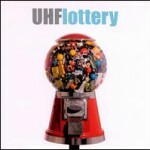 But with UHF and Lottery, here it is. The lads in UHF have been in countless bands over the past 15-20 years. They’ve been in Portland for the last five years, releasing one other album, Pieces, as UHF, a couple of years ago. Lottery is the story of an American everyman and his struggle to keep up with the Joneses; as well as his realization that his adolescent friendships and youthful dreams and ambitions are deteriorating, being supplanted through the acquisition of goods and the accumulation of wealth and status. While there is nothing particularly new in this premise, UHF, deliver an unique and tuneful perspective, all the same. Fronted by the brothers Leff, lead singer Jeremy who occasionally adds organ flourishes to the mix, and Jordan, who contributes guitar, bass, occasional piano and background vocals; Matt Johnson adds drums and background vocals, Jeff Nelson, guitars and bass. Together they create a sound that is reminiscent of the Who, the Beatles, the Kinks, Small Faces, Pink Floyd, Badfinger, XTC, World Party, Elliot Smith, Smithereens and later-period Tears For Fears. But soon enough, cracks begin to form, as the weight of the adult world begins to weigh upon the relationship. “Look up at the stars tonight/They look the same to you and I/Soon we’ll have to compromise//We’re best friends.” And the lines, “One will stay and one will move/One will win and one will lose/And do to me as I do to you/We’re best friends” seems to foresee some future treachery in the competition for personal achievement and gain. The next song, “Lottery,” fleshes out those concerns, adding new twists to the plot line, as well. “Did they tell you you’ve got/An equal shot/But there’s only room/For one at the top/You can always go to the mall and shop/And that’s all you need/And it’s a good thing/ ‘Cause your best friend won it all/ When they came to your street.” Prosperity or despair are a mere turn of the wheel away. Everyone must play. Melodically, the song tracks like a Badfinger tune. “Half Of Every Day” echoes the Beatles’ “Paperback Writer” in its instrumental construction. Lyrically, the song bemoans the realities of the workaday world. The next six songs form the central section of the suite— a quintet of songs about reunion and reminiscence. “Lucky Linda” wonders about a few Runyon-esque members of the old crew, Lucky Linda herself, Smiling Joe and poor John. The musical arrangement is a direct lift from Dream Academy’s 1985 hit “Life In A Northern Town.” Not coincidentally, Nick Laird-Clowes who wrote and sang that song took a songwriting class from Paul Simon. “It’s Wrong” is sad John’s story, although it is not altogether clear just what that story might be. “Camera,” “Reunion Day” and “School Days” center specifically on a gathering of old friends. The former song sounds like Badfinger doing parts of the Beatles’ “Dear Prudence.” Similarly, “Reunion Day” harkens to the work of Badfinger’s Pete Ham, as well as XTC’s Colin Moulding. “School Days” echoes Magic Bus period Who. In “Superstar” we see Joe at home— “He reads the news/Clips out the coupons and saves a few/And he feels free/Just like he won the lottery.” Finally “Fancy Street” seems to be a “Penny Lane”-like pastiche, with a vague cast of characters, including the Joneses— the butcher and his wife, the mayoral candidate; and poor John “Open your heart to poor John the beggar/His dirty dog barks as you walk by.” If the dog were clean, perhaps he wouldn’t bark at passersby. Just a thought. The Lennonish “Whatever The Weather” allows drummer Johnson the opportunity to cut loose with some exemplary Keith Moon-inspired, mortar-fire drum fills. Tastily laid back slide guitar is the instrumental loci for “Union Station. And finally, “Socks” is a deadpan koan that bears a strong resemblance to Pink Floyd’s “Dark Side Of The Moon” from the album of the same name. Certainly UHF have done their homework. They sound right out of 1967, contemporaries of the bands they are emulating. And, though far from tidy, the band seem to navigate fairly well within the parameters of their given theme. Some of the songs are rather pedestrian with not a lot to say. But they do gently nudge the somewhat nebulous plot in some direction. The Gumpy premise— Life is like a lottery. You never know who will get the winning number, who will lose it all— does not add significantly to the pool of human knowledge; but suffices, given that we are dealing with a Rock concept album here. Still, a brief perusal of Shirley Jackson’s notorious short-story “The Lottery,” might have given the guys a little more sinew with which to flesh out their occasionally thin imagery. But none of this near overshadows the fact that this album is a rousing success. UHF prove to be ambitious, if not particularly adventurous; portentous, but not pretentious. What will be especially interesting is this band when they hit their Abbey Road phase. In the meantime, this is one of the best local releases of the past year. Solid stuff.